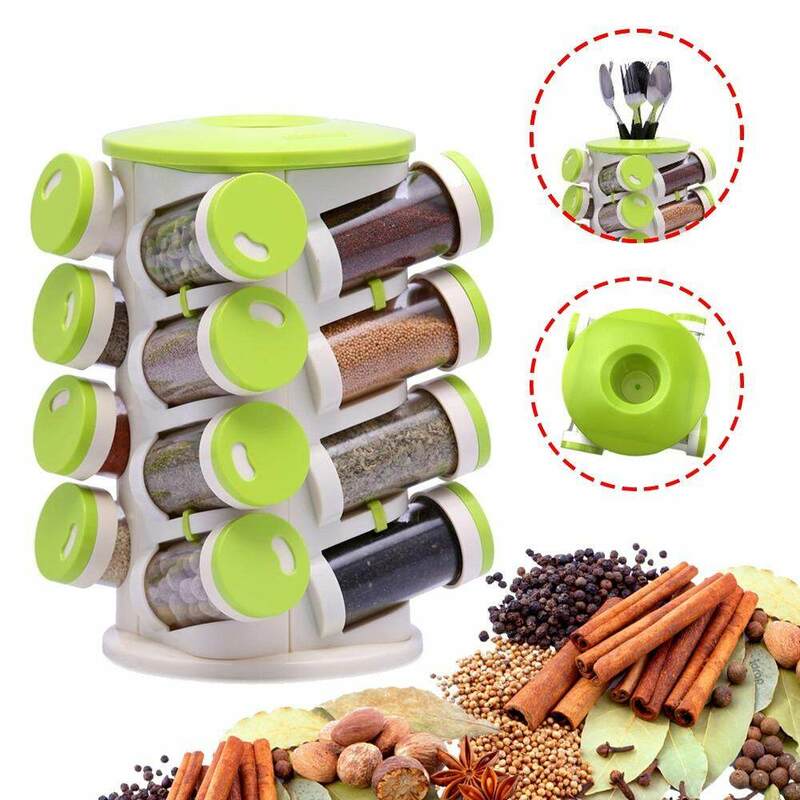 Grab your Discounted 16 In 1 Multifunction Spice Rack while the store LAUNCH DISCOUNT is on. Once we reach 300-unit sales, we will be increasing the price back up to $80.95 USD. This is absolutely a great gift! Spice up your kitchen with a modern charm by organizing your favorite, flavorful and aromatic seasonings and herbs in this 16 In 1 Revolving Spice Rack. Featuring a unique design with 16 separate jars in a revolving rack design, the spice rack is an ideal solution for storing and retrieving spices, seasonings, herbs and more. With an efficient design enabling easy retrieval of spices when needed, use this spice rack to organize your kitchen and save valuable time while cooking. You can store a great selection of your finest spices, herbs, condiments, mouth fresheners and more in these jars. With a specially designed revolving base that facilitates easy access to any of the 16 jars, the 16-in-1 spice rack is built withconvenience in mind. The jars are made from transparent plastic which makes it easy to identify the contents without having to open them. The jars are designed for easy handling and refilling. Furthermore, the rack comes with an added utility of cutlery holder on the top. Made from BPA free plastic, it is safe to store food items in these jars without fear of contamination. Made from 100% food grade plastic, the 16-in-1 spice rack is sturdy and will last for a long time with regular use. Beingdishwasher-safe, you can easily maintain the jars by regularly washing them. This smartly designed spice rack is a great way to organize your kitchen while adding a touch of style to it. It is made of environmentally friendly plastic, which is safe to use. The bottom is tilted so that the seasoning box is firmly attached to the spice rack. Rotate the cover to adjust the size of the hole and hermetic closure. The transparent cover provides easy viewing. With a spice rack. Suitable for spices, salt, pepper, tea, etc. It is an essential kitchen item in our modern life.